"One summer morning, my husband, Joe and I were dangling our feet from our dock on Goose Lake. I was watching some water weeds on the bottom, thinking they looked just like a giant turtle. Suddenly, they swam up toward us. It was a turtle, a huge snapping one, with an under water "garden" on its shell. "That experience gave me the inspiration for Mossy. I chose an eastern box turtle because I wanted my turtle to live on land and grow a gorgeous garden on her carapace. I named her friend Scoot because a turtle's shell is made up of plates called 'scutes'," pronounced the same way. "Joe and I thought it would be wonderful to have our own turtle pond. So we built one with rocks for sunning, caves to hide in from predators like raccoons, and water deep enough for hibernating during winter. "We had our first turtle move in this past June, and now a second turtle has arrived. The future for turtles looks bright!"" Scoot has never seen a turtle as beautiful as Mossy. But as Mossy walks toward him, her amazing garden swaying back and forth on her shell, someone picks her up and puts her in a basket. Mossy there, and a large glass-enclosed case becomes Mossy's new home. How she misses sitting on her rock by the waterfall. But most of all, she misses Scoot. As more and more visitors come to admire Mossy, Tory realizes that Mossy is sad. She is sure that Mossy wants to go home. How Mossy goes back to Scoot and how Dr. Carolina finds a way to keep the spirit of Mossy alive in the museum makes for a most satisfying and surprising ending. 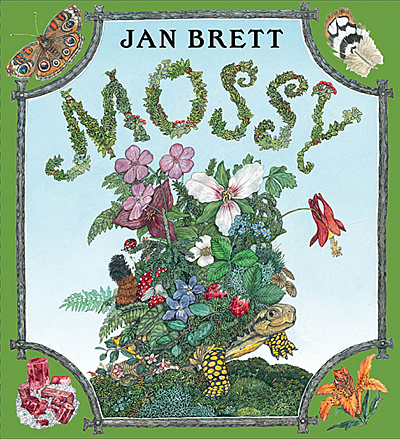 Jan Brett fans will pore over the colorful paintings, the lush borders displaying flowers, ferns, butterflies and bird, and the museum scenes filled with visitors in stylish Edwardian dress. Mossy and Scott are sure to become favorite characters for all ages in this unique story of love, loyalty and home.